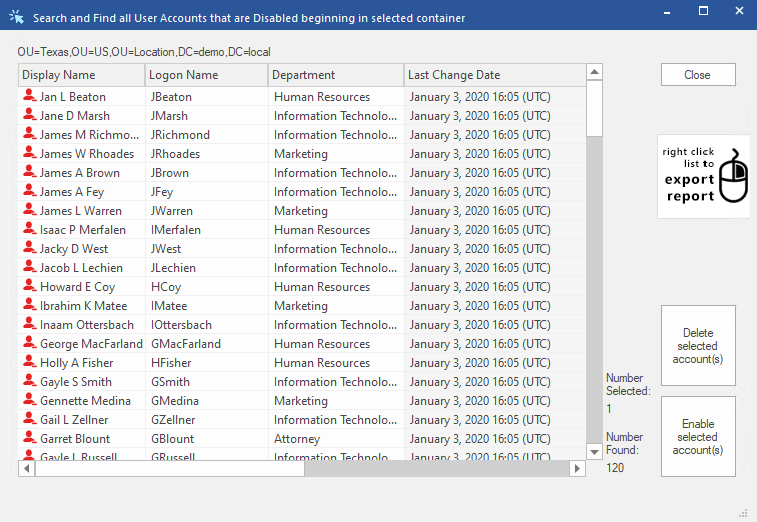 DSRAZOR for Windows makes it easy to keep track of your Active Directory users and groups. Quickly run AD user and group reports listing group membership, effective file permissions, accounts that are disabled, expired, locked, unused in X days, and more. With DSRAZOR, you can report on your Active Directory user accounts and filter on any combination of attributes in your AD schema. Which user accounts are disabled? Which users in a specific group have not logged in within the last 60 days? Which users a member of a specific group? Get started with reporting immediately. DSRAZOR comes with a plethora of ready-to-run reports to help you document Active Directory. DSRAZOR can be ran from any Windows workstation or server in your domain. Reports can be generated in the background while you complete other tasks.